Is playing Hasselbeck the right move? After missing the past five games with a back injury, Seahawks QB Matt Hasselbeck is expected to start this Sunday against Arizona. But is it the right call? The Hawks are more than halfway through a lost season and a loss to the Cardinals this week will mathematically eliminate the team from playoff contention. So what’s the point in playing a guy who isn’t 100%? 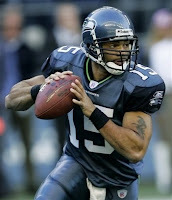 Sure, backup Seneca Wallace hasn’t done much to warrant confidence in Hasselbeck’s absence. But his supporting cast has been atrocious and Wallace has shown improvement. In last week’s game at Miami, Wallace completed 21 passes on 38 attempts and totaled 185 yards with one touchdown and zero interceptions. Compare that to the line of Dolphins starter C had Pennington: 22-36 passing, 209 yards, 1 TD, 1 INT. The backup nearly equaled the performance of his counterpart, the entrenched starter, and did so under adverse conditions: 80-degree heat, high humidity, 10:00 AM West Coast start time, down a receiver (Deion Branch). Don’t get me wrong, this isn’t a “Play Seneca Wallace!” shout out, but I just don’t see the point in risking injury to a franchise quarterback when the only two things currently at stake are pride and draft position. And frankly, I’d rather see this team finish 4-12 with a Top 10 pick instead of shoot for 7-9 with a mid-round selection. Let’s not ruin these dreams, Seahawks. Previous Post2008-2009 Husky Basketball PreviewNext PostGive Julius the damn ball!